Dover Castle is a medieval castle in Dover, Kent, England. It was founded in the 11th century and has been described as the "Key to England" due to its defensive significance throughout history. It is the largest castle in England. This site may have been fortified with earthworks in the Iron Age or earlier, before the Romans invaded in AD43. This is suggested on the basis of the unusual pattern of the earthworks which does not seem to be a perfect fit for the medieval castle. Excavations have provided evidence of Iron Age occupation within the locality of the castle, but it is not certain whether this is associated with the hillfort. The site also contains one of Dover's two Roman lighthouses (or pharoses), one of only three surviving Roman-era lighthouses in the world, and the most complete standing Roman structure in England. 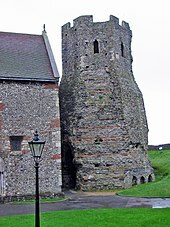 Built in the early 2nd century, the 5-level 8-sided tower was made of layers of tufa, Kentish ragstone, and red bricks. The castle lighthouse survived after being converted into a belfry in the Saxon era (c.1000), having a new upper layer added (c.1430), and was partially renovated in 1913-1915. The remains of the other are located on the opposing Western Heights, across the town of Dover. The view down from the (possibly Saxon) burgh, and Harbour beyond. Then he marched to Dover, which had been reported impregnable and held by a large force. The English, stricken with fear at his approach had confidence neither in their ramparts nor in the numbers of their troops ... While the inhabitants were preparing to surrender unconditionally, [the Normans], greedy for money, set the castle on fire and the great part of it was soon enveloped in flames...[William then paid for the repair and] having taken possession of the castle, the Duke spent eight days adding new fortifications to it'. The Castle was first built, entirely out of clay. It collapsed to the ground and the clay was then used as the flooring for many of the ground-floor rooms. In 1088, eight knights were appointed under tenures to guard Dover Castle, their names were: William d'Albrincis; Fulberl de Dover, William d'Arsic; Geoffrey Peverell; William Maminot; Robert du Port; Hugh Crevecoeur; and Adam Fitzwilliam. It was during the reign of Henry II that the castle began to take recognisable shape. The inner and outer baileys and the great keep belong to this time. Maurice the Engineer was responsible for building the keep. From 1179 to 1188, the King spent over £6,500 on the castle, an enormous sum, considering that his annual revenue was likely around £10,000. In 1216, during the First Barons' War, a group of rebel barons invited the future Louis VIII of France to come and take the English crown. He had some success breaching the walls, but was ultimately unable to take the castle. The vulnerable north gate that had been breached in the siege was converted into an underground forward-defence complex (including St John's Tower), and new gates built into the outer curtain wall on the western (Fitzwilliam's Gate) and eastern (Constable's Gate) sides. During the siege, the English defenders tunnelled outwards and attacked the French. During the time of Stephen de Pencester, a windmill was erected on Tower 22, which was later known as the Mill Tower. By the Tudor age, the defences themselves had been superseded by gunpowder. They were improved by Henry VIII, who made a personal visit, and added to it with the Moat Bulwark. Dover Castle was a crucial observation point for the cross-channel sightings of the Anglo-French Survey, which used trigonometric calculations to link the Royal Greenwich Observatory with the Paris Observatory. This work was overseen by General William Roy. Massive rebuilding took place at the end of the 18th century during the Napoleonic Wars. William Twiss, the Commanding Engineer of the Southern District, as part of his brief to improve the town's defences, completed the remodelling of the outer defences of Dover Castle adding the huge Horseshoe, Hudson's, East Arrow and East Demi-Bastions to provide extra gun positions on the eastern side, and constructing the Constable's Bastion for additional protection on the west. Twiss further strengthened the Spur at the northern end of the castle, adding a redan, or raised gun platform. By taking the roof off the keep and replacing it with massive brick vaults he was able to mount heavy artillery on the top. Twiss also constructed Canon's Gateway to link the defences of the castle with those of the town. With Dover becoming a garrison town, there was a need for barracks and storerooms for the additional troops and their equipment. The solution adopted by Twiss and the Royal Engineers was to create a complex of barracks tunnels about 15 metres below the cliff top and the first troops were accommodated in 1803. The windmill on the Mill Tower was demolished during the Anglo-American War of the orders of the Ordnance Board. It was said that the sale of materials from the demolished mill did not cover the cost of the demolition. At the end of the Napoleonic Wars, the tunnels were partly converted and used by the Coast Blockade Service to combat smuggling. This was a short-term endeavour though, and in 1827 the headquarters were moved closer to shore. The tunnels then remained abandoned for more than a century. The outbreak of the Second World War in 1939 saw the tunnels converted first into an air-raid shelter and then later into a military command centre and underground hospital. In May 1940, Admiral Sir Bertram Ramsey directed the evacuation of French and British soldiers from Dunkirk, code-named Operation Dynamo, from his headquarters in the cliff tunnels. 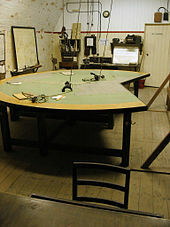 A military telephone exchange was installed in 1941 and served the underground headquarters. The switchboards were constantly in use and had to have a new tunnel created alongside it to house the batteries and chargers necessary to keep them functioning. A statue of Admiral Sir Bertram Ramsay stands outside the tunnels in honour of his work on the Dunkirk evacuation and protecting Dover during the Second World War. After the war the tunnels were used as a shelter for the Regional Seats of Government in the event of a nuclear attack. This plan was abandoned for various reasons, including the realisation that the chalk of the cliffs would not provide significant protection from radiation, and because of the inconvenient form of the tunnels and their generally poor condition. Tunnel levels are denoted as A - Annexe, B - Bastion, C - Casemate, D - Dumpy and E - Esplanade. Annexe and Casemate levels are open to the public, Bastion is 'lost' but investigations continue to gain access, Dumpy (converted from Second World War use to serve as a Regional Seat of Government in event of an atomic war) is closed, as is Esplanade (last used as an air raid shelter in the Second World War). Between 2007 and 2009, English Heritage spent £2.45 million on recreating the castle's interior. According to figures released by the Association of Leading Visitor Attractions, nearly 350,000 people visited Dover Castle in 2010. The Queen's & Princess of Wales's Royal Regiment Regimental Museum is located in the castle. Dover Castle remains a Scheduled Monument, which means it is a "nationally important" historic building and archaeological site that has been given protection against unauthorised change. It is also a Grade I listed building, and recognised as an internationally important structure. The Lord Warden of the Cinque Ports is officially head of the castle, in his conjoint position of Constable of Dover Castle, and the Deputy Constable has his residence in Constable's Gate. Royal chapel - Located within the keep, dedicated to Thomas Becket. St Mary in Castro - A Saxon church, rebuilt in the Victorian era. ^ Kerr, Nigel (1984). A Guide to Norman Sites in Britain. Granada. p. 44. ISBN 0-586-08445-2. ^ Broughton, Bradford B. (1988). Dictionary of Medieval Knighthood and Chivalry. Greenwood Press. p. 102. ISBN 0-313-25347-1. ^ Cathcart King, David J. (1983). Catellarium Anglicanum: An Index and Bibliography of the Castles in England, Wales and the Islands. Volume I: Anglesey–Montgomery. Kraus International Publications. p. 230. ^ National Monuments Record. "MONUMENT NO. 468006". English Heritage. Archived from the original on 27 February 2014. Retrieved 2012-04-23. ^ a b "The Roman Pharos at Dover Castle". Google Arts & Culture. Retrieved 8 April 2019. ^ "The Roman Lighthouse, Dover, Kent". The Journal of Antiquities. 12 May 2013. Retrieved 5 June 2018. ^ William of Poitiers, Gesta Guillelmi, ed. and tr. R. H. C. Davis and Marjorie Chibnall (1998). The Gesta Guillelmi of William of Poitiers. OMT. Oxford and New York: Clarendon. ISBN 0-19-820553-8. ^ Hasted, Edward (1799). "The History and Topographical Survey of the County of Kent". Simmons and Kirkby. p. 61. ^ Prestwich, Michael (1999). Armies and Warfare in the Middle Ages. Yale University Press. p. 285. ISBN 0-300-07663-0. ^ Dr, Jeffrey L. Forgeng; Forgeng, Jeffrey L.; Singman, Jeffrey L. (1999). Daily Life in Medieval Europe. Greenwood Publishing Group. p. 109. ISBN 9780313302732. ^ a b "Dover Castle and the Great Siege of 1216". De Re Militari. 28 April 2014. Retrieved 5 June 2018. ^ a b Coles Finch, William (1933). Watermills and Windmills. London: C W Daniel Company. p. 196. ^ "Dover Castle - Moat's Bulwark". 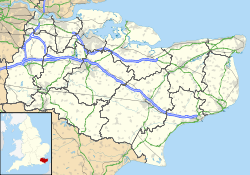 Dover – Kent. Retrieved 5 June 2018. ^ "Civil War in the South-East 1642". British Cilil War Project. Retrieved 5 June 2018. ^ The land we live in, a pictorial and literary sketch-book of the British empire. London: Charles Knight. 1849. p. 128. ^ "Richard Dawkes and John Reading – the Civil Wars and Interregnum". The Dover Historian. 18 December 2013. Retrieved 18 April 2019. ^ Roy, William (1785). "An Account of the Measurement of a Base on Hounslow-Heath". Philosophical Transactions of the Royal Society of London. 75: 385–480. doi:10.1098/rstl.1785.0024. ^ a b "Dover Castle". Kent Past. Retrieved 5 June 2018. ^ a b c d e "Dover Castle: Sectret Wartime Tunnels". Beyond the Point. Retrieved 5 June 2018. ^ "Dover Castle". www.dovertowncouncil.co.uk. Archived from the original on 2 April 2013. Retrieved 25 July 2012. ^ "Queen's & PWRR Regiment Museum". 1st Battalion the Queen’s Regiment. Retrieved 5 June 2018. ^ "Scheduled Monuments". Historic England. Historic England. Retrieved 29 March 2017. ^ "Dover Castle". British Listed Buildings. British Listed Buildings. Retrieved 29 March 2017. ^ "List of Lord Wardens". Cinque Ports. Retrieved 5 June 2018. ^ "History of Dover Castle". English Heritage. Retrieved 8 April 2019. ^ Historic England. "Church of St Mary Sub-Castro (Grade I) (1070328)". National Heritage List for England. Retrieved 17 September 2016. Coad, Jonathan (1995). Book of Dover Castle and the Defences of Dover. B. T. Batsford. ISBN 0-7134-7289-8. Jeffrey, Kate (1997). Dover castle. English Heritage. Wikimedia Commons has media related to Dover Castle. Dover Castle page at the English Heritage website.